Stocking pre-hinged aluminum screen doors is tough on supply companies when budgeting inventory. With pre-hinged doors, a company has to stock a certain amount of lefts and rights. In contrast, stocking quality screen doors that actually have four applications saves money and has more opportunities to be sold, compared to much of its competition. What purchaser wouldn’t love that? A pre-hinged door makes it difficult on contractors when homeowners change their minds about which way they want their doors to swing. And what if there is some sort of miscommunication between the homeowner and the contractor? That’s tough on everybody. With a pre-hinged door, the contractor has to leave the job site, travel all the way back to the supplier to return the door, and hope they have the correct hinged door in stock. Time and money wasted! If you are a contractor who wants to leave that headache behind, then use a screen door that can have a hinge installed on the left OR right side of the door (bonus tip: a full-length piano hinge keeps the door secure). 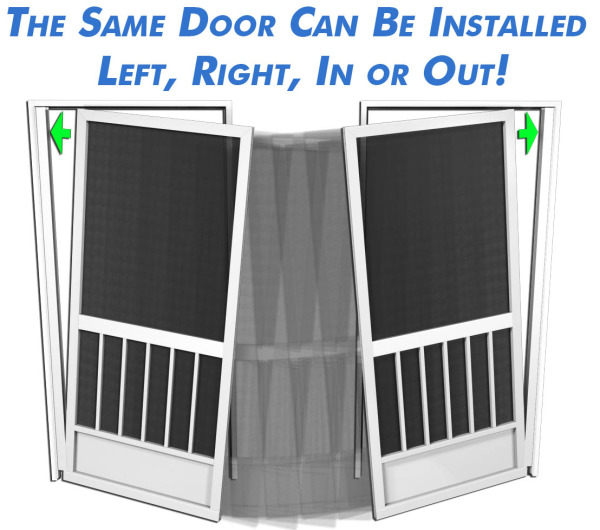 If it is an in-swing application, simply install the door on the inside. Of course, then all you need is a different handle. PCA Products offers screen doors with a full length piano hinge that is easily installed to allow a door to swing left or right. We also offer a wide variety of handles and hardware to accommodate your needs. Learn how you can stock or sell PCA aluminum screen doors.